This machine is like new and has very little wear. Developed for Mold & Die repair: the PUK® U5. Precision welding made easy. Made in Germany. Incorporating the latest technology, the PUK® U5 offers an easy to use solution for precision mold and die repairs. Utilizing micro TIG technology, the welder produces small, consistent spot welds that penetrate the mold surface. The welded areas are strong and can withstand the pressures and working conditions during the molding process. All heat is concentrated at the spot of the weld thereby eliminating the possibility of distortion and metal stress caused by overheating. Save Money: Keep mold repairs in house! Stop sending out for laser and precision welding. Affordable alternative to a laser welder at a fraction of the cost. Repair your molds the same day. No pre-welding heat treatment required. Welds Quickly: 1 spot weld every 0.8 seconds! Small spot welds polish out quickly. Mobility: Ready to use with pre-programmed presets for most common applications. Takes the calculations and guess work out. Extremely accurate weld placement. Sharp electrode tip (0.6mm and 0.8mm) touches the exact location of weld spot. Take the U5 welder to the press for repair! Magnetic microscope attaches directly to mold while still in the press! Minimal heat: Prevents damage caused by overheating of mold, thus increasing life of the tool. All heat is concentrated only at the spot of the weld. Take the guess work out! Simply select the pre-program for your mold repair application and start welding! Each pre-program is set to the optimal weld pulse and time lapse for the specified mold repair application. Or if you prefer, manually override the pre-programmed settings using convenient new "Touch Screen" feature. Weld anywhere on any type of mold large OR small! The adjustable and magnetic microscope base affixes to any metal surface. The microscope arm is extremely flexible to allow for comfortable welding on almost any mold surface. Keep the microscope at your bench or take it to the mold for a quick in-press repair. 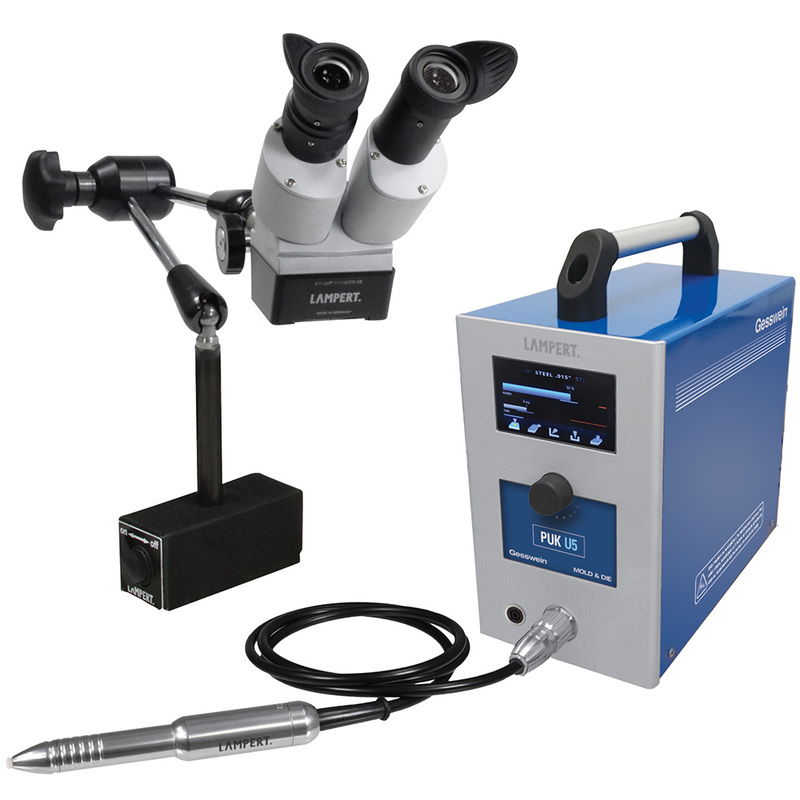 The 10X microscope comes complete with integrated LED lighting for proper illumination of the welding surface. A protective eye shutter built into the microscope provides protection for eyes. Field of view 20mm. Microscope can connect directly to your mold base. Extend the reach of your PUK® U5 with the PUK® U5 Extension Package! For some large molds and in-press repairs, a few extra feet of reach may be necessary. This package includes an extended handpiece, extended magnet ground, and microscope extension cables. The extended handpiece measures approx. 8’ (2.5m) compared to the 4’ handpiece included with the PUK® U5. The extended magnet cable measures 8’ in length. The microscope extension cables add on an additional 6.5’ in length to the standard PUK® microscope, thus totaling 12.5’ in overall length. Each of these components comes standard with your PUK® U5. Tack welding wire to surface prior to welding. Holds wire in place which also serves to protect mold surface. Complete with electrode handpiece. Microscope extremely flexible 10x, 20mm field of view, integrated LED lighting and built-in protective eye shutter. The PUK® flow regulator enables the exact setting of the recommended 2 liters per minute flow rate. Its precise and easy but above all, it’s reliable! The argon gas allows for clean, oxidation free welds. For simple and rapid sharpening of PUK® electrodes. The diamond disc rotates when the button is pressed allowing for quick and convenient electrode sharpening. The unit plugs into the back of the machine. For use with the tack welder only. Press foot pedal to create each tack weld. Simply attach near the repair area. The convenient magnet connects with ease. 150mm in length. The PUK® comes with 10 pre-sharpened 0.6mm and 0.8mm electrodes for immediate use. The thin electrode increases precision by touching the exact spot of weld. Just prior to weld, the electrode pulls back into the handpiece allowing for a clean and precise weld spot. "With the PUK U5 Mold & Die, we have reduced our laser weld outsourcing by 80%. It has also allowed us to become more efficient and flexible with scheduling repairs by eliminating the need to schedule an appointment for laser welding. The PUK U5 Mold & Die is easy to use and requires minimal training. It has quickly become a huge asset to our tooling department."